Spreading falsities is nothing new. The use of propaganda to sway political favour goes back to Roman times. But today, with our short attention spans and cluttered newsfeeds, the distinction between real and fake news is even more unclear. The more time poor we become, the faster we try to consume our news, inevitably absorbing everything. But how often do we stop to think whether or not a story is true? 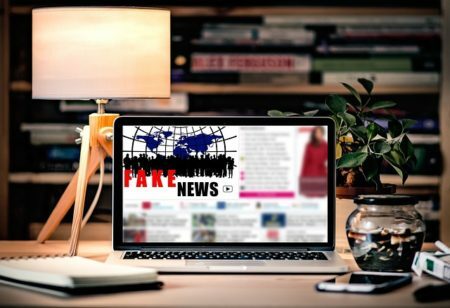 Research published in the Nature Human Behaviour journal from the combined studies of Indiana University, Shanghai Institute of Technology, and Yahoo Research, led by Dr Diego Fregolente Mendes de Oliveira claims that “information overload” and our “limited attention” spans are to blame for the rapid spread of fake news. “Anecdotal evidence of hoaxes, conspiracy theories and fake news in online social media is so abundant that massive digital misinformation has been ranked among the top global risks for our society, with fake news a major topic of debate in the United States and Europe,” Mr Oliveira said. Everyday news readers are struggling to differentiate what seems like a true story from actual fact. In this post we will look at why fake news stories are so popular and how to filter your news to ensure it comes from reputable sources. Before we look at the viral nature of fake news, let’s take a closer look at what fake news actually is. The first important point that we have already touched on is that it’s not new. Consider that propaganda was the most well-used fake news of the 20th century, we can define fake news in the same way. It is the deliberate misinformation or hoaxes spread via traditional print and broadcast news media or online. That’s all there is to it. So why is it such a big deal? Well, this comes down to mainstream media. The Telegraph claims that it was at Donald Trump’s first press conference as President-elect when the term “fake news” broke out of media discussions and into the mainstream. “You are fake news!” he pointed at CNN’s Jim Acosta while refusing to listen to his question. Like any new buzzword or phrase, the media have run with it. The story is completely false, but it was shared on Facebook over half a million times and was found to have been written by a man paid to spread false stories for profit. Beyond the historical uses of propaganda to influence public discourse, fake news now is to spread for no other reason than as click-bait content to give advertisers a guaranteed audience. As we can see from the above example, not all fake news comes from large organisations either, nor is it always state-supported. A lot are created and distributed by individuals for a cut of any advertising profits made. Just because a story sounds good, doesn’t make it true. As humans with our own opinions and belief systems, we seek information that confirms what we already believe to be true. We seek confirmation. Fake news producers and distributors are playing on this instinct knowing that if what they share reflects what the majority of people already want to believe, it is more likely to be accepted as truth. c) Overestimation of shared beliefs – where we feel others believe the same things we do. So not only are we thinking ourselves to be far more objective than we actually are, but are also then sharing our misguided belief with others who we consider to also believe the same things we do and on it goes. It’s not just adult readers either. Though our children seem to be fluent in iPhone from birth, this study reports that the children tested were almost completely unable to tell the difference between real and fake news. It is easy to argue that some news stories are just nice to believe, like this story that claims Buzz Aldrin, the second man on the moon, said his greatest achievement in life was not punching President Donald Trump in the face. There is definitely social value in jokes intended to satirise the media such as The Trump Documents, which are carefully created fake government documents that outline the President’s “fear of lighthouses”. The first danger is that fake news stories, often distributed by bots, take up much of social media to change public discourse entirely. These tactics have been blamed for the election outcome and leave no room for legitimate journalism in the spotlight. But what of the flip side. There are significant dangers where politicians claim something that is 100% true is ‘fake news’ because they happen to disagree with it. The issue boils down to the inability of free press to be able to do it’s job without being hindered by junk stories going viral, respected news sources having their names tarnished by fake stories shared under their banners and legitimate news stories being labelled as fake by a government who doesn’t want to be criticised. Well, Facebook updated its advertising policy to make it clear that it will not display ads in websites or mobile apps that contain fake news. Google has promised to crack down on misinformation and claim to have begun working with independent fact-checking organisations to label suspicious stories as false. Stop reading sources known for creating and sharing fake news. Unfollow Facebook friends who insist on sharing fake news (You can unfollow someone without their knowledge and remain Facebook friends.) Learn how. Fact check news stories with professional debunkers such as Fact Check and Snopes. Look for the Fact Check label in Google News. Fake news is not a new problem but the rate at which it is shared makes it seem impossible to escape. But, there are steps you can take to curate your digital life. Spend more time scrutinising information shared online, consider the sources, who is paying for this information to be out in the world and start unfollowing users who are spreading this junk across your social media platforms.